Herpes simplex virus (HSV) causes tracheobronchitis and pneumonitis; however, to date, there has only been one report of an endobronchial mass caused by HSV type II. 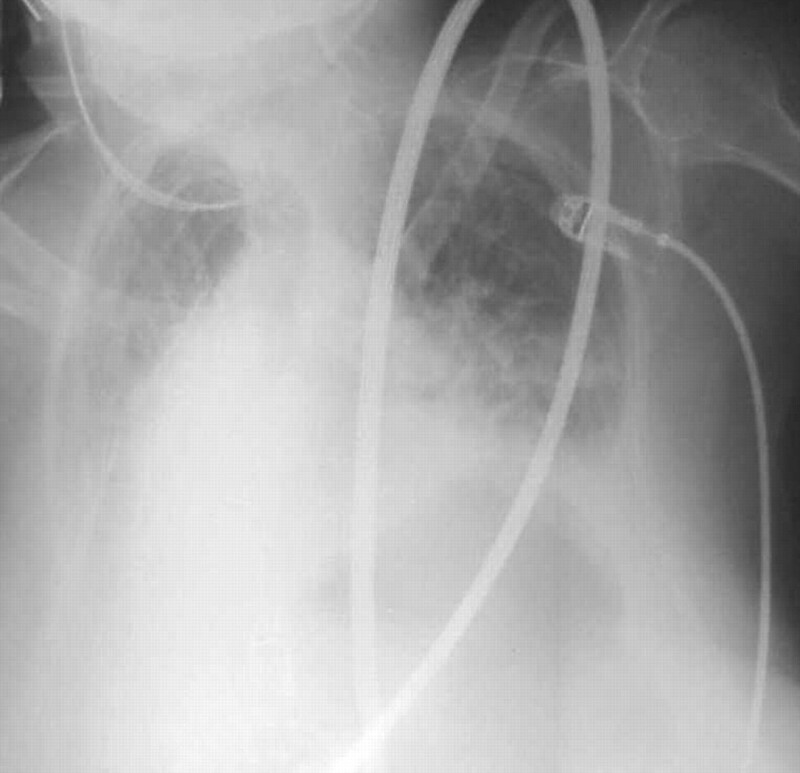 This case study describes a 68-yr-old female with severe kyphoscoliosis who was intubated for acute on chronic hypercapnic respiratory failure and developed blood-tinged endotracheal secretions. 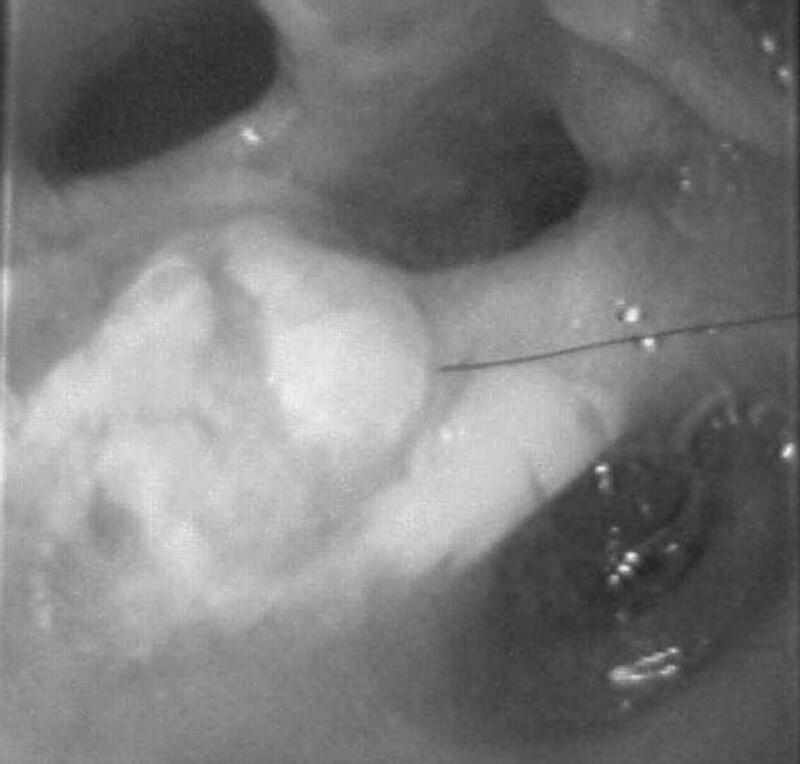 Fibreoptic bronchoscopy demonstrated an endobronchial mass in the right middle lobe. Cultures grew HSV type I and biopsy specimens demonstrated cytopathological changes consistent with HSV infection. 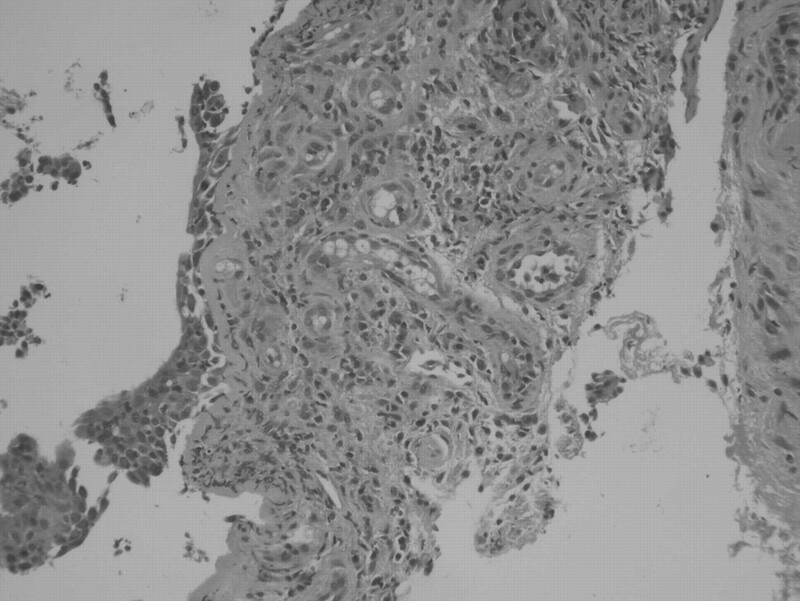 This is the first reported case of HSV type I presenting as an endobronchial tumour. A 68-yr-old White female with severe restrictive lung disease caused by kyphoscoliosis presented with a 1-week history of dyspnoea at rest, right-sided chest pain and swelling of the right lower extremity. Her past medical history included multiple congenital abnormalities, including webbed neck and mild mental retardation (although without a described karyotype), aortic stenosis, hypertension, hypercholesterolaemia, hypothyroidism, peripheral vascular disease, migraine headaches and smoking. At the time of admission, the patient's medication included daily atorvastatin (20 mg), levothyroxine (125 μg), ezetimibe (10 mg), furosemide (40 mg) and potassium chloride (40 mEq). On admission to Bridgeport Hospital (Bridgeport, CT, USA), the patient was alert and oriented. Her vital signs included a temperature of 37°C, heart rate of 102 beats·min−1, blood pressure of 117/63 mmHg, respiratory rate of 42 breaths·min−1 with room air oxygen saturation of 71%. General examination revealed that she had short stature, webbed neck, deafness, mutism and severe, deforming kyphoscoliosis. The patient had reduced chest expansion, reduced lung sounds in the bases and no adventitious breath sounds. Cardiovascular examination revealed a grade 3/6 systolic ejection murmur. Her abdomen was soft and non-tender without organomegaly or masses. She had moderate bilateral pitting pedal oedema below the knees. Skin was unremarkable with no lesions. The laboratory examination was significant for an elevated white blood cell count of 13.6 K with no bandaemia, haemoglobin 12.3 g·dL−1 and platelet count 451,000·mm−3. Chemistries revealed sodium 142 mEq·L−1, potassium 4.8 mEq·L−1, chloride 103 mEq·L−1, bicarbonate 28 mEq·L−1, glucose 272 mg·dL−1, blood urea nitrogen 34 mg·dL−1 and creatinine 0.9 mg·dL−1. The patient had mildly elevated liver tests with an aspartate transaminase of 217 U·L−1, alkaline phosphatase of 349 U·L−1, total protein of 6.8 g·dL−1, albumin of 3.6 g·dL−1 and total bilirubin of 1.0 mg·dL−1. Her troponin-T was positive (1.83 ng·mL−1) and she had an elevated brain naturietic peptide of 35,587 pg·mL−1. Initial arterial blood gas on 4L nasal oxygen revealed a pH of 7.23, carbon dioxide tension of 60 mmHg and oxygen tension of 28 mmHg. Chest radiography revealed small lung volumes and bi-basilar infiltrates (fig. 1⇓). Chest radiograph showing kyphoscoliosis and small lung volumes with bi-basilar infiltrates. The patient was admitted to the medical intensive care unit with a diagnosis of acute on chronic hypercapnic respiratory failure and community-acquired pneumonia. She was treated with bi-level positive-pressure ventilation (inspiratory positive airway pressure = 14 cmH2O, expiratory positive airway pressure = 5 cmH2O), parenteral azithromycin, ceftriaxone and heparin for possible venous thromboembolism. On the second day in hospital, the patient developed worsening hypoxaemia requiring endotracheal intubation and mechanical ventilation. Due to continuing fevers, antimicrobial coverage was changed empirically to piperacillin/tazobactam and vancomycin. The patient also developed decreasing arterial oxygen tension/inspiratory oxygen fraction and bilateral four-quadrant air-space opacities consistent with adult respiratory distress syndrome (ARDS). Due to persistent sepsis, a fibreoptic bronchoscopy was performed 2 days later. Bronchoscopy revealed extensive inflammation of bronchial mucosa with a 3×2-cm white, fungating mass near the osteum of the right middle lobe (fig. 2⇓). The lesion was brushed and biopsied. Right bronchus intermedius showing a white, fungating mass seen near the osteum of the right middle lobe. The biopsy consisted of two fragments of bronchial tissue with extensive ulceration, and was remarkable for abundant granulation tissue and necrotic debris (fig. 3⇓). There was no evidence of malignancy. Focally, the epithelial cells in the nonulcerated area demonstrated intranuclear inclusions typical of herpes virus (fig. 4⇓). Cytological examination demonstrated many epithelial cells with intranuclear inclusions. The nuclei had homogenous, smudged pale grey centres with nuclear chromatin pushed to the edges of the nuclear membranes. There were also multinucleated cells with nuclear moulding indicative of viral cytopathic changes (fig. 5⇓). The cytological preparations were negative for malignant cells. The biopsy was stained with monoclonal antibodies to herpes simplex virus (both HSV I and HSV II), using commercially available antibodies (Dako Corporation, Carpinteria, CA, USA), on an automated immunostainer (Dako). These antibodies react with HSV I- and HSV II-specific proteins, as well as with viral products common to both HSV I and HSV II. These antibodies do not cross-react with herpes zoster virus, cytomegalovirus, Epstein-Barr virus or echo virus. Bronchial tissue biopsy showing extensive ulceration and abundant granulation tissue and necrotic debris (haematoxylin and eosin stain). Bronchial biopsy, showing grey-coloured homogeneous intranuclear inclusions (haematoxylin and eosin stain). Bronchial brush cytology specimen showing a multinucleated giant cell, with moulding of nuclei (Pap stain). HSV immunostains of the biopsy specimen were also positive (fig. 6⇓). 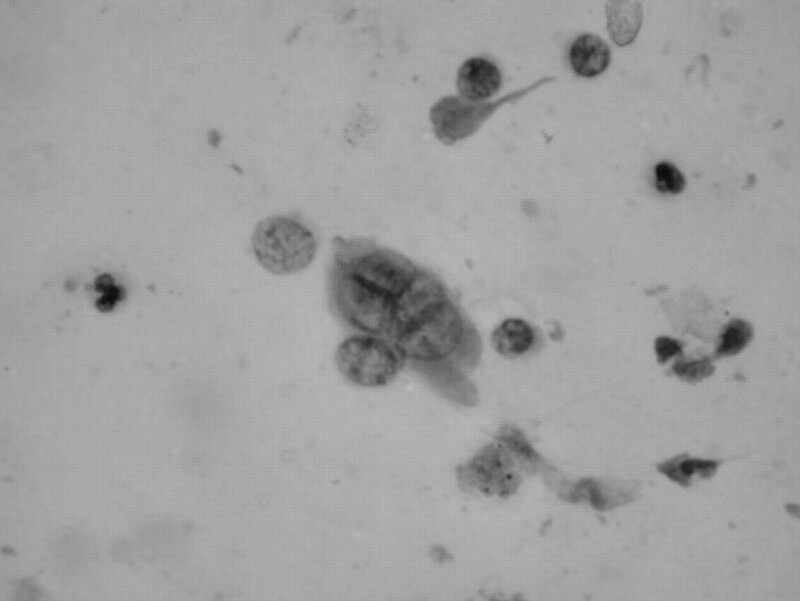 The culture confirmed HSV type I in the bronchial wash. 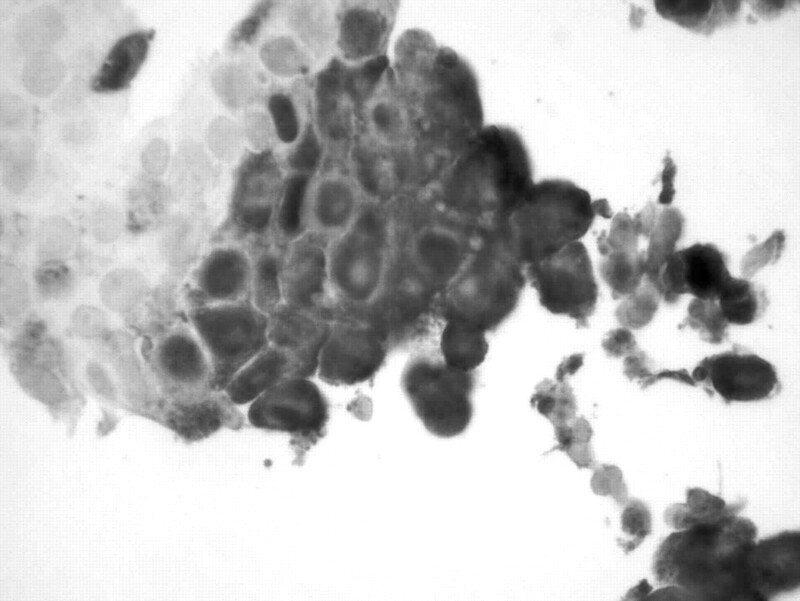 Bronchial biopsy, stained with antibodies specific for herpes, showing strong positivity within many epithelial cell nuclei (immunoperoxidase). Despite initiating acycolovir therapy on day 29 after admission, the patient became increasingly hypotensive requiring vaso-pressors. Pulmonary embolism was suspected. However, due to her worsening condition, family members informed caregivers that the patient would not want prolonged life-sustaining therapies. She was extubated, medicated with morphine sulphate, titrated to ameliorate discomfort, and died shortly after. Primary infection with and reactivation of HSV are not uncommon in immunocompromised patients. HSV tracheobronchitis was first reported in 1949 1. Pulmonary involvement of the lower respiratory tract by HSV in adults has been reported in recipients of solid organ and stem cell transplantations 2, 3, and in patients with burns 4, terminal cancer 5, 6, AIDS 7 or patients receiving corticosteroids 8. Herpes tracheobronchitis and bronchopneumonia have also been reported in immunocompetent patients, particularly in the elderly 9, 10. HSV I and II, herpesvirus 6, 8 and varicella-zoster virus are species of the herpesvirus group. All can cause pneumonia. There is some evidence from autopsy studies which suggests that HSV from the oropharynx can be introduced into the lower respiratory tract during endotracheal intubation 11, 12. Another theory is that ARDS may cause reactivation of pre-existent herpes in the vagal ganglia with resultant herpes tracheobronchitis 13. HSV cytopathic effects seen on the oropharyngeal swabs of critically ill patients can be as high as 22% 14. Lung pathology of HSV infections includes focal or diffuse, often bloody, ulcers in the tracheobronchial epithelium with or without necrotising pneumonia 2. Although HSV can be cultured from sputum, diagnosis of HSV infection has been made from the characteristic cytological and histological changes seen in endobronchial brushings and biopsy specimens. The cytopathic changes are not specific for HSV, but can also be seen in varicella infections. Although less sensitive, light microscopic detection of inclusions remains useful, since it is technically simple and easy to perform. Other, more sensitive methods include immunological detection of viral antigen, PCR-based molecular amplification methods and viral cultures. Only one previous case of HSV endobronchial mass has been reported 15. The patient presented with ulcerative tracheobronchitis and a cauliflower-like lesion that occluded the right upper lobe segmental bronchus. The diagnosis of HSV type II was made on the basis of immunohistochemical staining for anti-HSV II antibodies. However, no cytopathic changes were evident on biopsy. Herpetic involvement of larynx presenting like laryngeal neoplasm has also been reported 16. Although no immunostaining for herpes was performed in this case, the lesion showed remarkable improvement with acyclovir therapy. Endobronchial masses simulating neoplasm have also been reported with cytomegalovirus, mycobacterium species and mucormycosis 17–19. 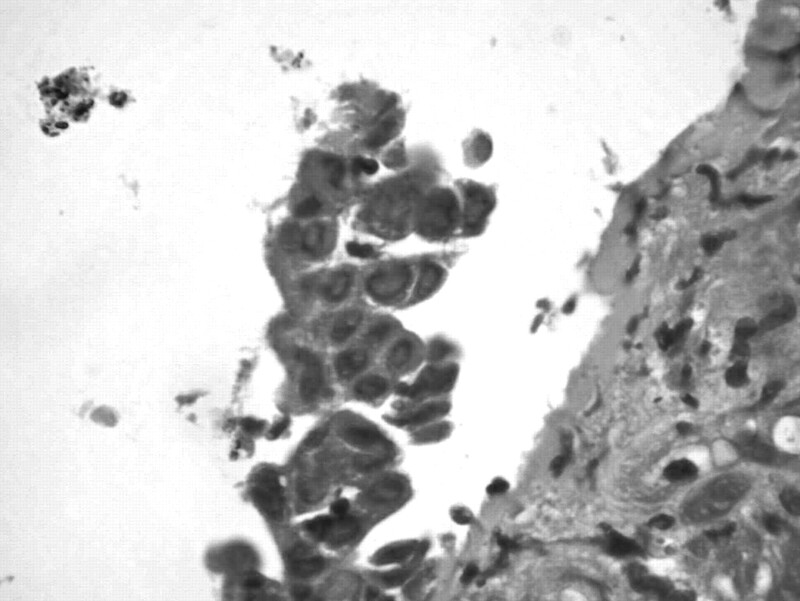 The endobronchial mass of the patient presented here may have resulted from extensive necrosis with formation of abundant granulation tissue in the subepithelial zone, as a reaction to epithelial inflammation. No malignancy was identified in multiple cytology specimens and the biopsy specimen, and all other cultures were negative. In conclusion, this case study presents the first reported case of herpes simplex virus type I infection presenting with an endobronchial mass. Although herpes simplex virus was not the evident cause of death in this patient, it contributed to significant morbidity that, theoretically, could be easily treated with antiviral therapies. Morgan HR, Finland M. Isolation of herpes virus from a case of atypical pneumonia and erythema multiforme exudativum with studies of four additional cases. Am J Med Sci 1949;217:92–95. Ramsey PG, Fife KH, Hackman RC, Meyers JD, Corey L. Herpes simplex virus pneumonia: clinical, virologic, and pathologic features in 20 patients. Ann Intern Med 1982;97:813–820. Taplitz RA, Jordan MC. Pneumonia caused by herpes viruses in recipients of hematopoietic cell transplants. Semin Respir Infect 2002;17:121–129. Byers RJ, Hasleton PS, Quigley A, et al. Pulmonary herpes simplex in burns patients. Eur Respir J 1996;9:2313–2317. Rosen P, Hajdu SI. Visceral herpes virus infections in patients with cancer. Am J Clin Pathol 1971;56:459–465. Buss DH, Sharyj M. Herpesvirus infection of the esophagus and other visceral organs in adults. Incidence and clinical significance. Am J Med 1979;66:457–462. Quinnan GV Jr, Masur H, Rook AH, et al. Herpesvirus infections in the acquired immune deficiency syndrome. JAMA 1984;252:72–77. Wiest PM, Flanigan T, Salata RA, Shlaes DM, Katzman M, Lederman MM. Serious infectious complications of corticosteroid therapy for COPD. Chest 1989;95:1180–1184. Sherry MK, Klainer AS, Wolff M, Gerhard H. Herpetic tracheobronchitis. Ann Intern Med 1988;109:229–233. Graham BS, Snell JD Jr. Herpes simplex virus infection of the adult lower respiratory tract. Medicine (Baltimore) 1983;62:384–393. Nash G, Foley FD. Herpetic infection of the middle and lower respiratory tract. Am J Clin Pathol 1970;54:857–863. Nash G. Necrotizing tracheobronchitis and bronchopneumonia consistent with herpetic infection. Hum Pathol 1972;3:283–291. Tuxen DV, Cade JF, McDonald MI, Buchanan MR, Clark RJ, Pain MC. Herpes simplex virus from the lower respiratory tract in adult respiratory distress syndrome. Am Rev Respir Dis 1982;126:416–419. Bruynseels P, Jorens PG, Demey HE, et al. Herpes simplex virus in the respiratory tract of critical care patients: a prospective study. Lancet 2003;362:1536–1541. Armbruster C, Drlicek M. Herpes simplex virus type II infection as an exophytic endobronchial tumor. Wien Klin Wochenschr 1995;107:344–346. Del Toro JJ, Ferrandis Pereperez E, Serrano Badia E, Pons Rocher P. Herpetic pseudotumor laryngitis. An Otorrinolaringol Ibero Am 1999;26:39–45. Karakelides H, Aubry MC, Ryu JH. Cytomegalovirus pneumonia mimicking lung cancer in an immunocompetent host. Mayo Clin Proc 2003;78:488–490. Asano T, Itoh G, Itoh M. Disseminated Mycobacterium intracellulare infection in an HIV-negative, nonimmunosuppressed patient with multiple endobronchial polyps. Respiration 2002;69:175–177. Tomita S, Takeda N, Hasumoto M, et al. A case of endobronchial mucormycosis with peculiar bronchoscopic findings. Nihon Kokyuki Gakkai Zasshi 2004;42:181–184.